1 Preheat oven to 325°. Bring beef to room temperature before roasting, about 1 hour. 2 Combine mustard with 1 Knorr® Beef flavored Bouillon Cube, garlic and chopped leaves from 5 sprigs of thyme and 2 1/2 sprigs rosemary in small bowl. 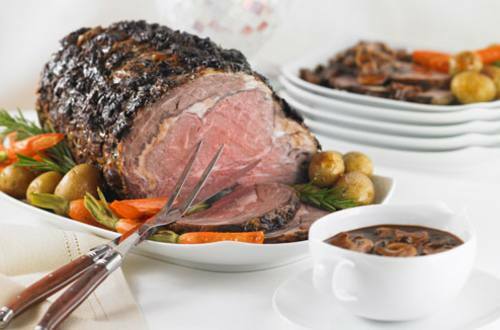 Season, if desired, with black pepper, then evenly spread beef with mustard mixture on top and sides. 3 Arrange beef, mustard-side up, in large roasting pan. Roast, uncovered in center oven until desired doneness*, about 2-1/2 hours. 4 Meanwhile, heat Country Crock® Spread and oil in large skillet over medium-high heat and cook mushrooms and remaining herbs until tender, about 3 minutes. 5 Remove roast to carving board, loosely covered with aluminim foil and let stand 15 minutes. 6 Reserve 3 tablespoons drippings from pan, discarding the rest. Heat reserved drippings in roasting pan and cook shallots, stirring occasionally, until tender, about 3 minutes. Stir in flour with wire whisk until smooth. Stir in water, remaining Bouillon Cube, wine and vinegar until no lumps remain. Stir in mushrooms and herbs. Bring to a boil, stirring constantly, until thicken, about 3 minutes. Discard herb sprigs. Serve over sliced beef.